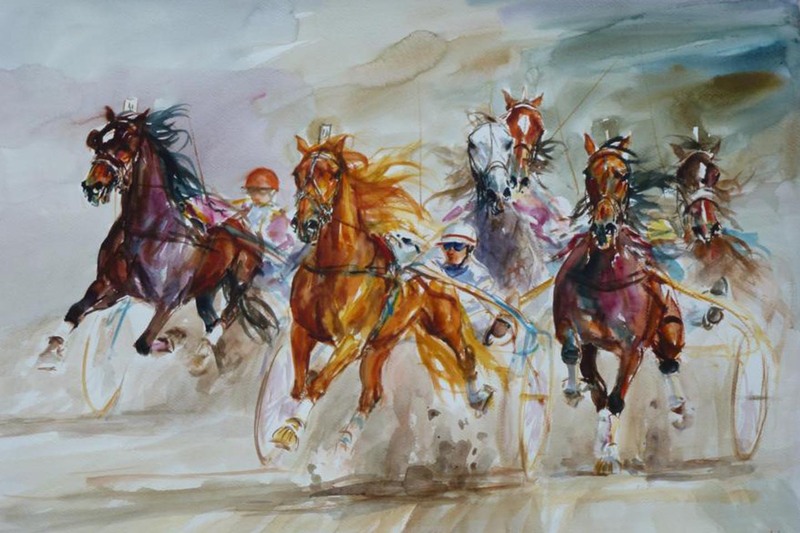 Polish artist Zenon Aniszewski is a devotee of watercolor painting in particular – which is the painting technique that does not forgive any mistakes and therefore displays the true master. 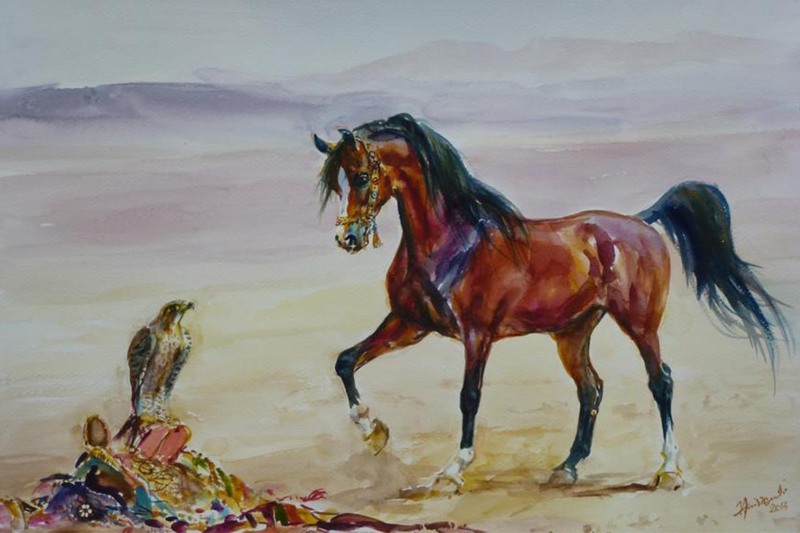 His main subject is horses, so of course there is room here for Arabian horses, who have a longstanding tradition in Poland. 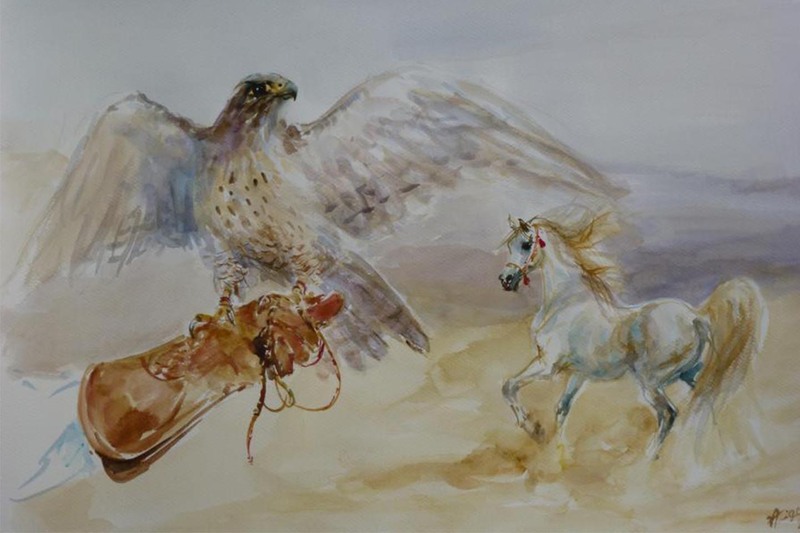 Artist Zenon Aniszewski comes from North Poland, the medieval fortified town of Grudziaz, where he was born in 1948. Even when he was a young boy, his teachers made note of his talent of drawing, but upon finishing school, instead of embarking on a career as an artist or attending to respective academic studies, he joined the military forces to become an officer. 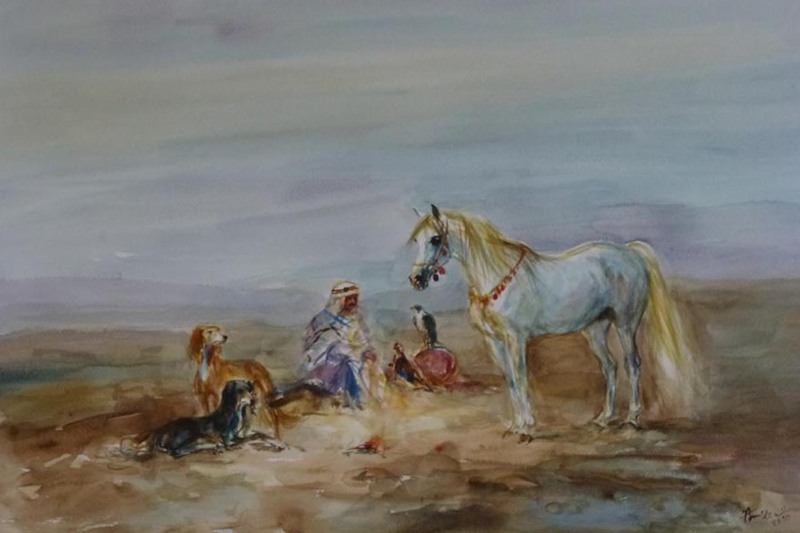 He proved to be too sensitive for military service, quit after academy training, and re-connected with horses, addressing them not just as the budding artist he was, but also for therapeutic reasons. 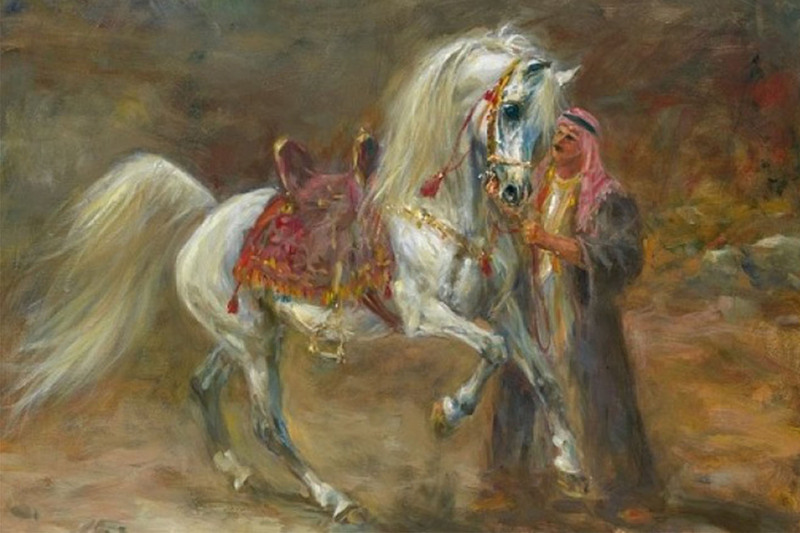 Stimulated by the power, grace, and beauty of horses, his first paintings of them emerged during the 1960ies. They were good enough to draw the attention of Danzig art professor Jerzy Feldmann towards Zenon Aniszewski, resulting in his being granted Danzig Art Academy attendance from 1970 to 1973. 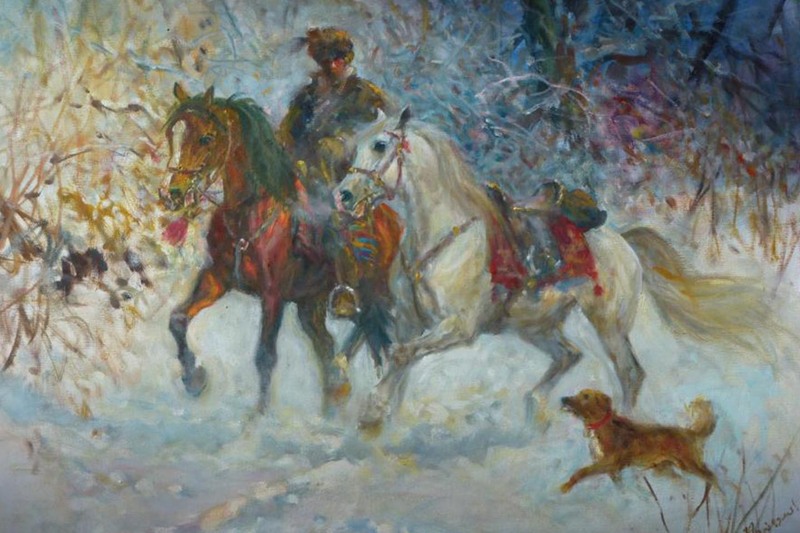 With this training, Aniszewski had acquired the skills to get going as an artist, horses would never let go of him, and so he eventually embarked on his career as a horse painter in the tradition of the great names in horse art, particularly of the Polish horse painters of the 19thcentury. 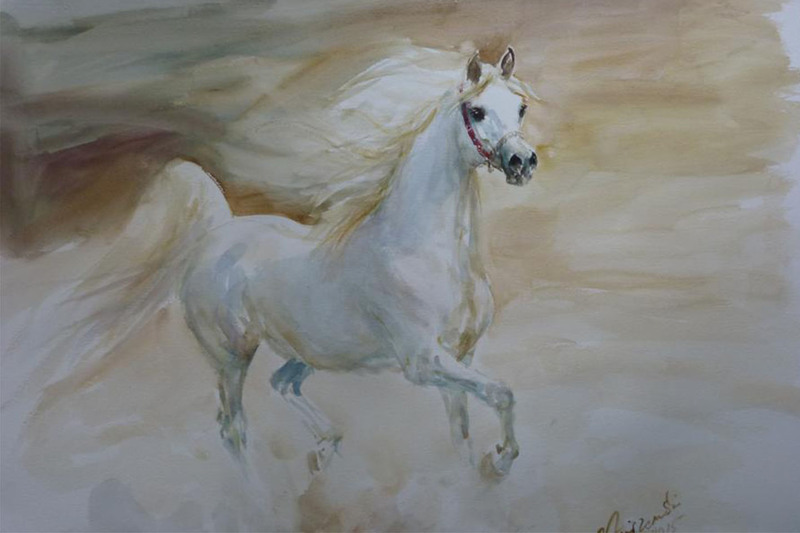 In the Style of the Old Masters The painting techniques most preferred by Zenon Aniszewski are oil and watercolor painting. Anybody who ever had the opportunity to look at his diligent studies and drawings will, however, quickly realize the degree of mastery this artist has reached in the graphics arts. 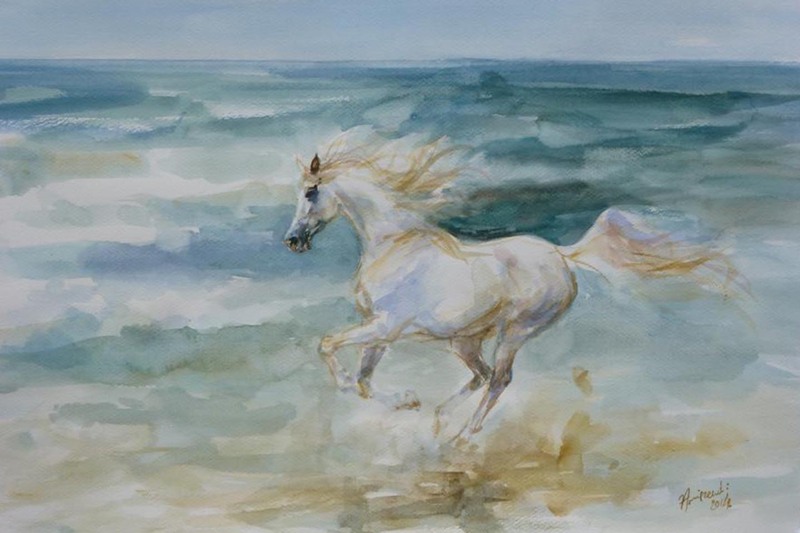 The fabric that becomes apparent in his drawings, the quick and sure stroke of the pencil, is what Aniszewski translates into watercolor paintings with apparently effortless consistency. 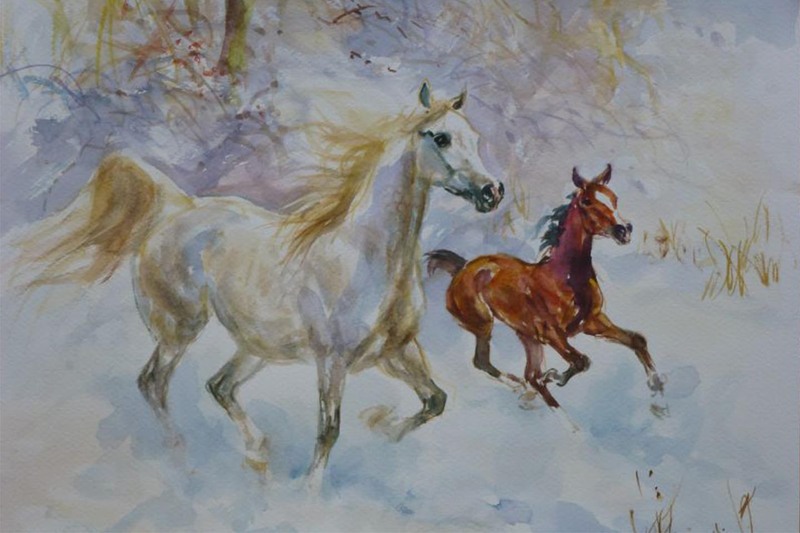 With that, Aniszewski takes his place among the great artists and horse painters whose true skills take brilliant form in their drawings and watercolor paintings. 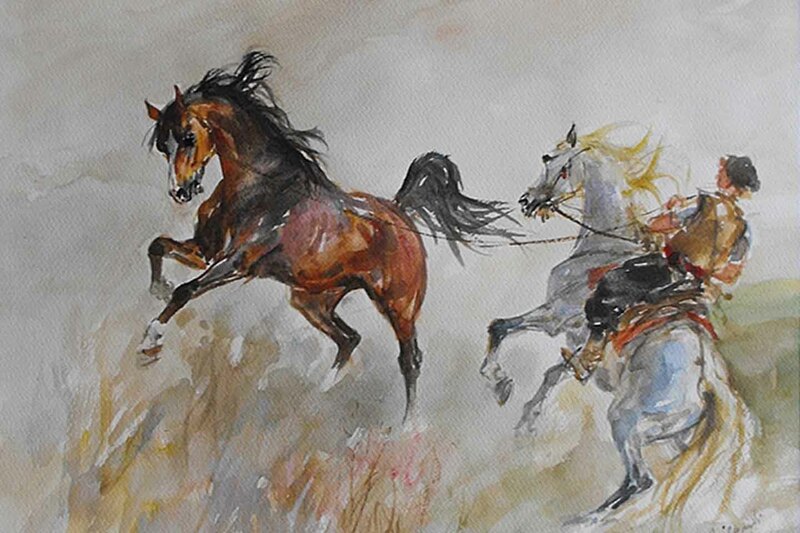 So in addition to painters such as Eugène Delacroix or Théodore Géricault who are famous for their drawings, studies and watercolor paintings of horses, Zenon Aniszewski takes his place among his Polish role models Piotr Michalowski and Juliusz Kossak. This is no wonder, given that the Polish painters of the romantic era would take quite a lot of their bearings from their French role models, which were not only Delacrois and Géricault, but also and particularly Horace Vernet, who regularly socialized with a number of artists from all over Europe. With artists such as Vernet, Michalowski, and Kossak, an approach to painting has come full circle to include Zenon Aniszewski. 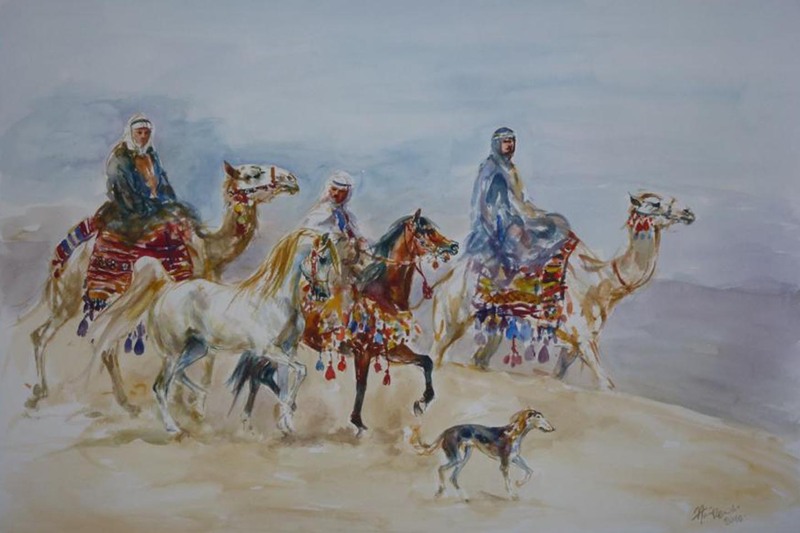 All of them prepared their famous works of oil painting by drawing studies and painting in watercolors, but all of them also created drawings that are independent works of art. 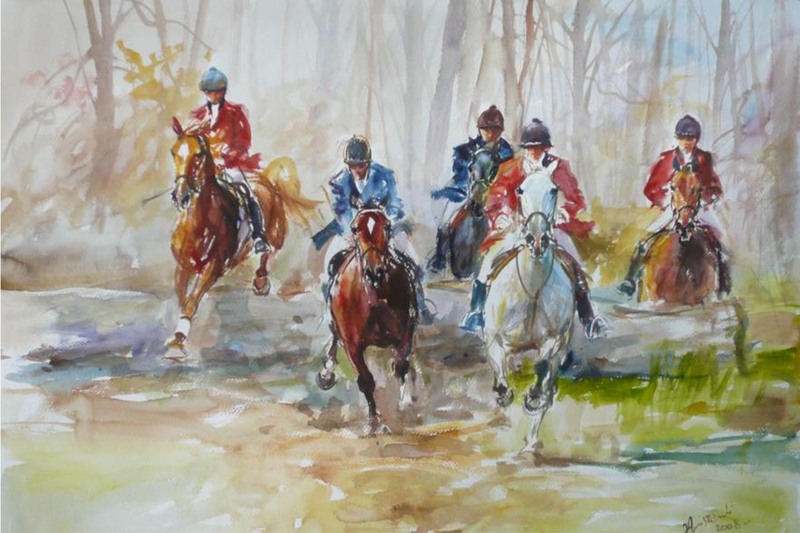 The Masters of Watercolor Painting Of course, Aniszewski also paints in oil, which is a technique where the paint is opaque and permits several corrections, if necessary. Aniszewski’s area of mastery, however, is painting in watercolors, which is a technique that will often be met with ignorance or even contempt from so-called art connoisseurs, as it does not dramatically set the great and the sublime in a gilded frame, as is the case when opaque techniques of painting are used. 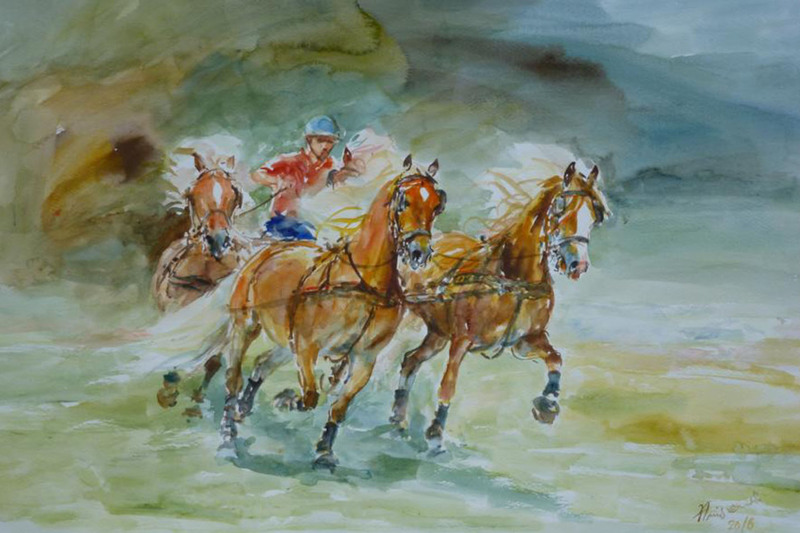 When paining in watercolors, no corrections are possible, the true master comes into his own. 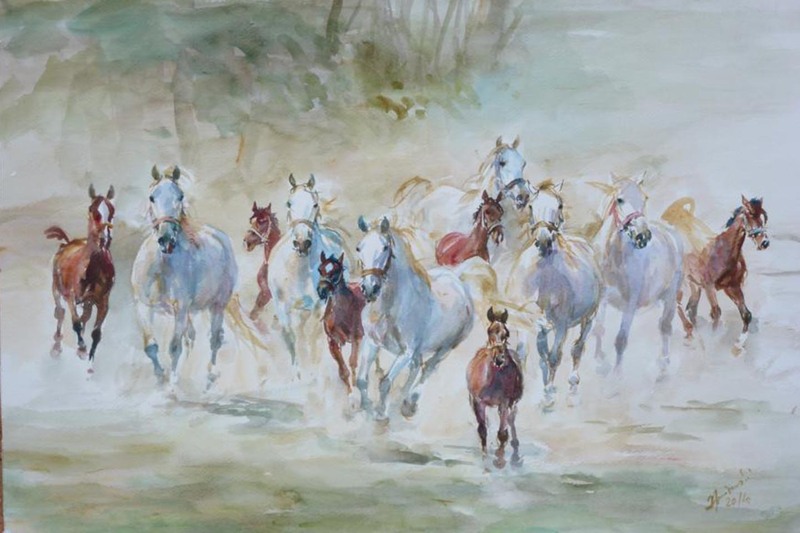 It’s the deft brushwork, the definite placing of colors, the skilfully easy free play between painted and varnished areas of painting, white and colored areas of the paper, all of which make watercolor painting such an irresistible affair. 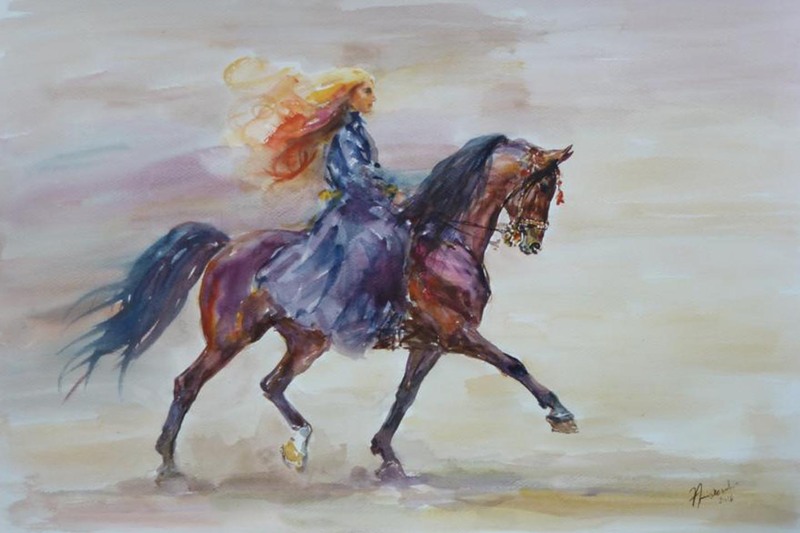 In a watercolor painting, the artist records the way he identifies with his subject, empathizes with it, perceives and appreciates it in all its easy lightness, its expression, its movements, and in the fleetingness of the moment. 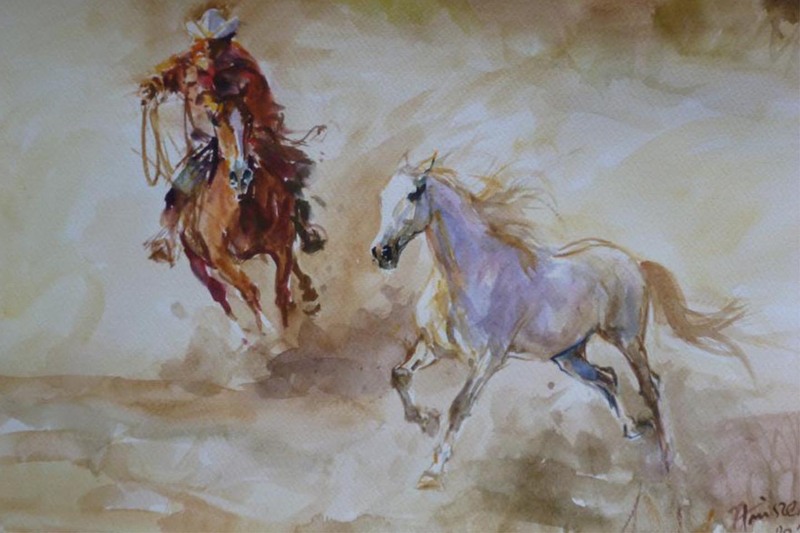 A watercolor painting will disclose an artist’s signature, not to say his soul. 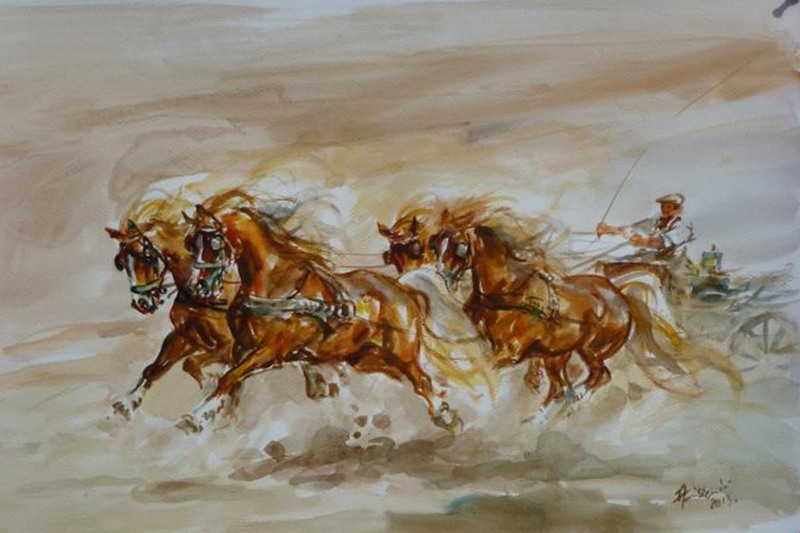 Among all the artists’ techniques, it is probably the most challenging one, as it separates the wheat from the chaff, the craftsmen of horse painting from the true artists of the genre. 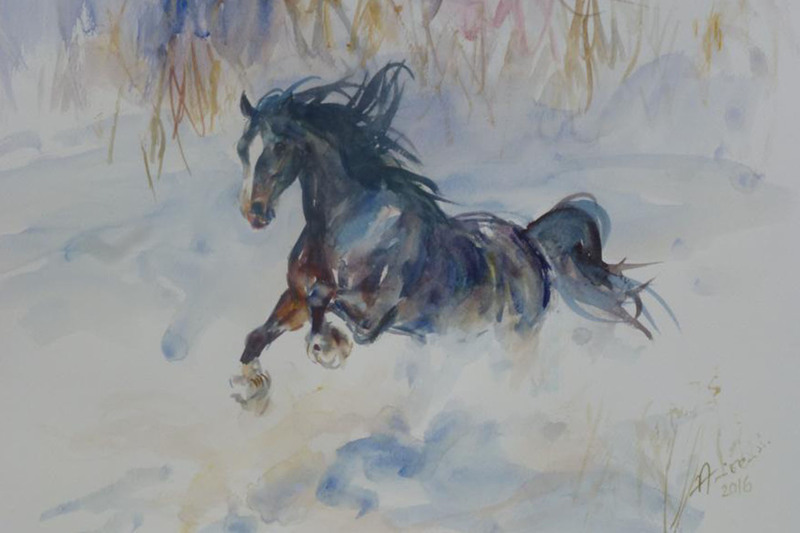 Aniszewski documents his success as a horse painter by not just being a good observer, one who has a sure hand in translating into painting the input that his subjects provided him with. 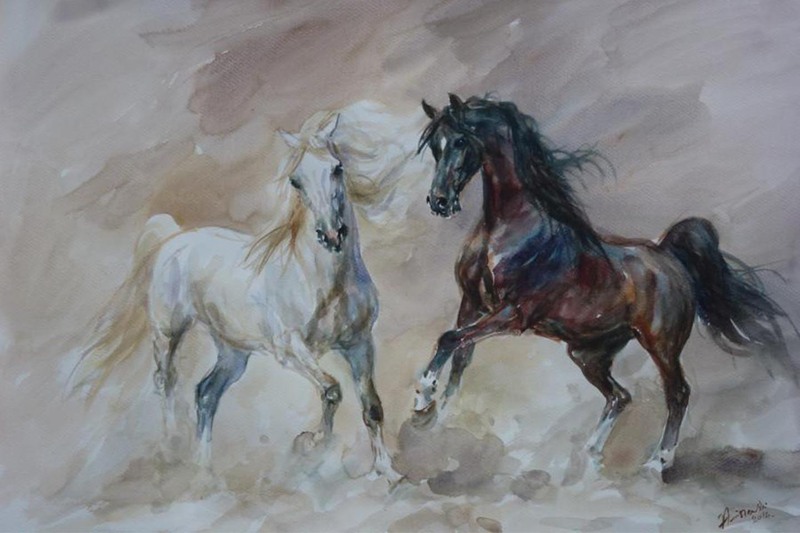 When he studies his subjects, he does not use photos for it, but goes out: into nature, onto the pasture, the racetrack, the obstacle course, so as to observe horses in all of their aspects and expressions of life. 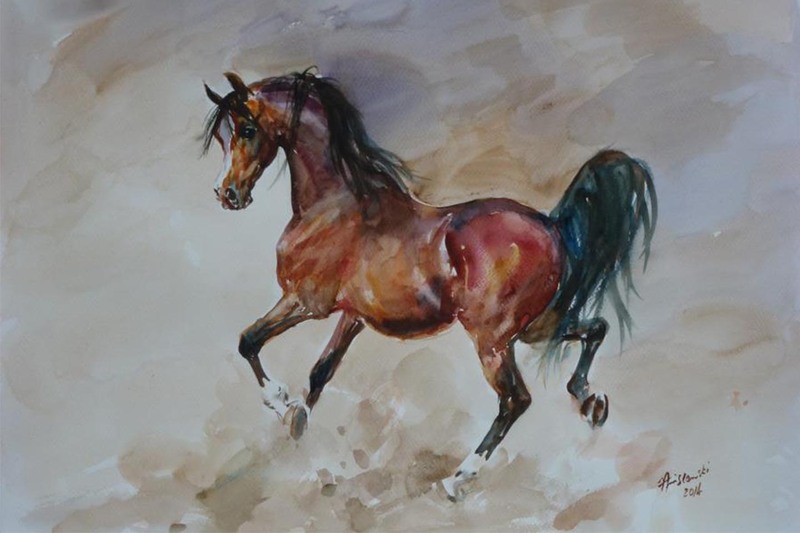 Setting him off from many other horse painters is Aniszewski’s ability to approach his self-chosen task of putting the essence of his observations on paper with his characteristic verve and freedom of movement, which means less of an emphasis on naturalistic or photographic accuracy , but serves to bring his models and subjects to life in a way undreamt-of. 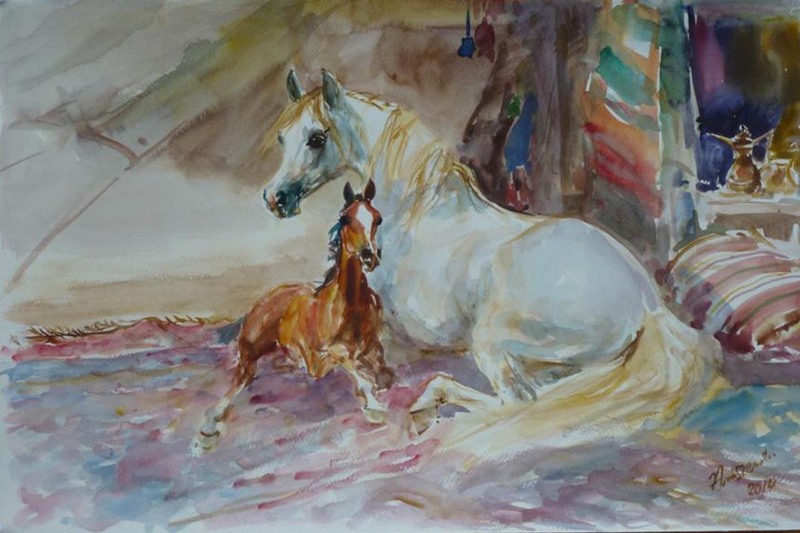 In this endeavor, watercolor painting offers him a richness of possibilities for artistic expression that is not feasible with oil painting. 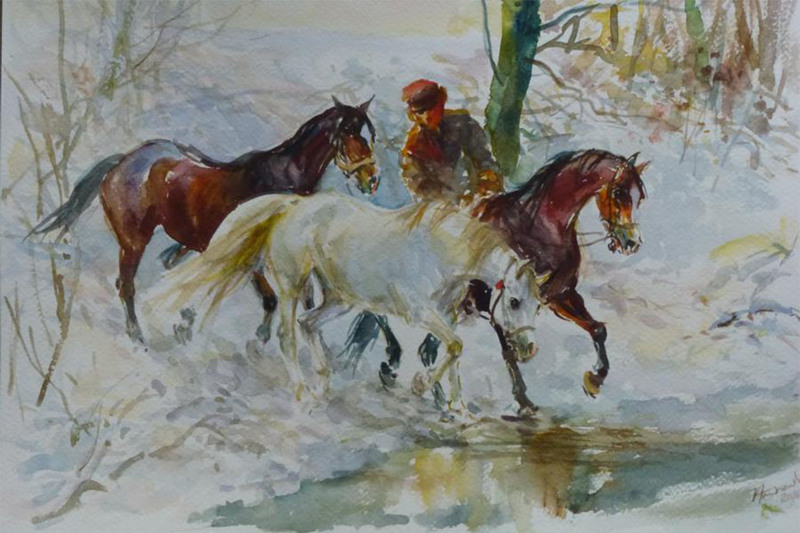 A Wide Range Zenon Aniszewski’s paintings cover a wide range of horse depictions, from the tranquil moments of a mare peacefully cropping grass with her newborn foal at her side, to the frenetically cantering herd and fighting stallions, scenes from sports events, and to large-scale paintings reminiscent of the hunts that Polish magnates staged during the 19th century. One would think that Aniszewski’s repertoire is inexhaustible, as you will ever discover in his works things that are new and inspiring. 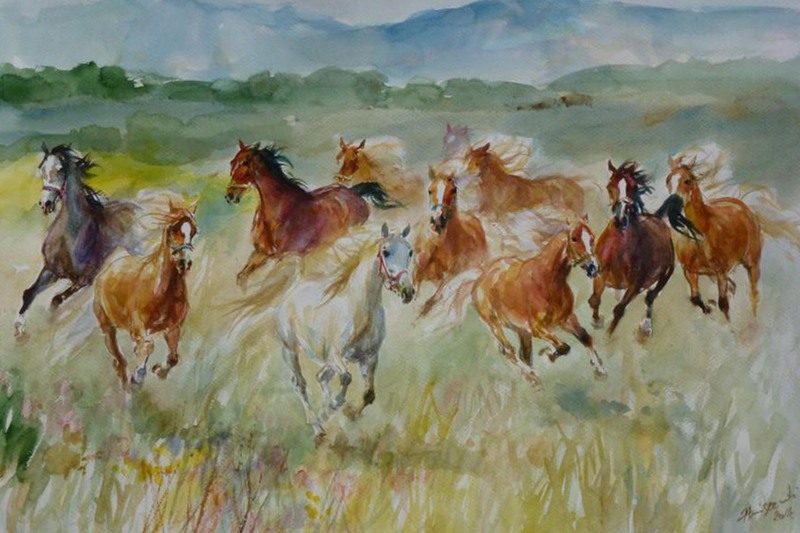 His pictures confront the onlooker with horses: he appears to effortlessly capture the ease of movement, the beauty of the creature, and the character of the animal. 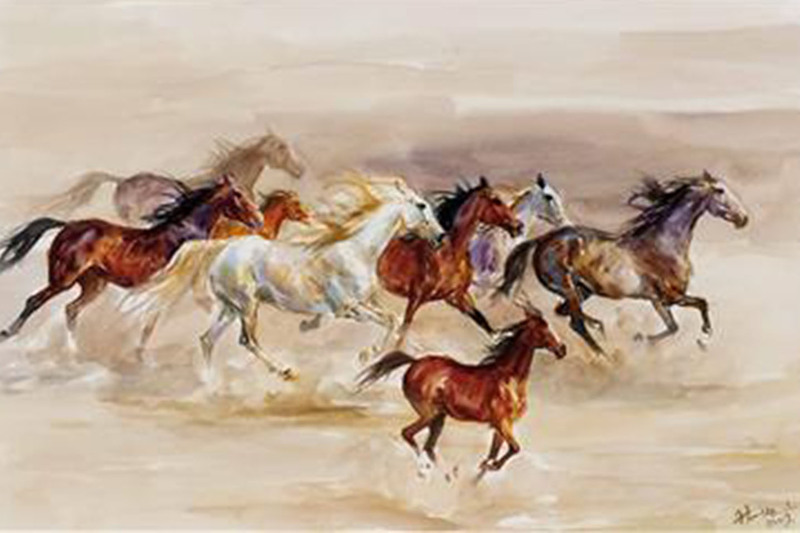 His paintings do without the pathetic gravity that uses horses as a decorative element rather than displaying them as independent creatures. 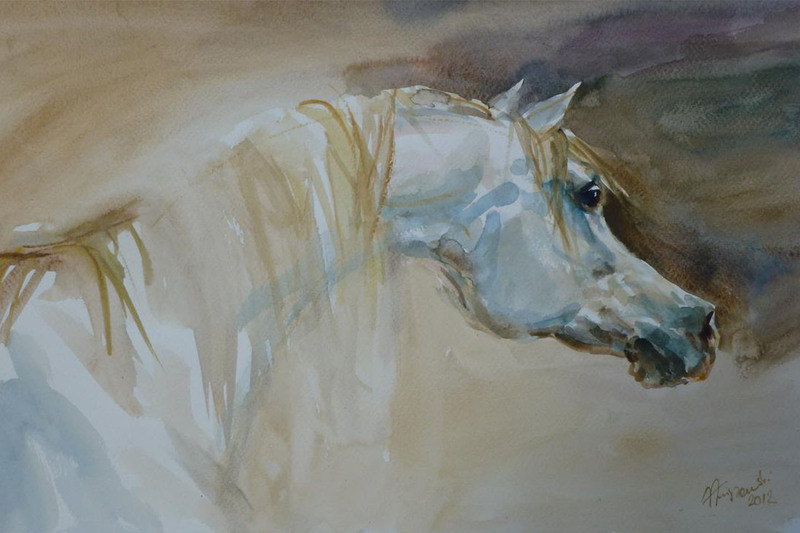 The history of the arts owes this important step to George Stubbs, probably the greatest horse painter ever: to impart the essence of the creature to the horse, to give him his character and his personality. 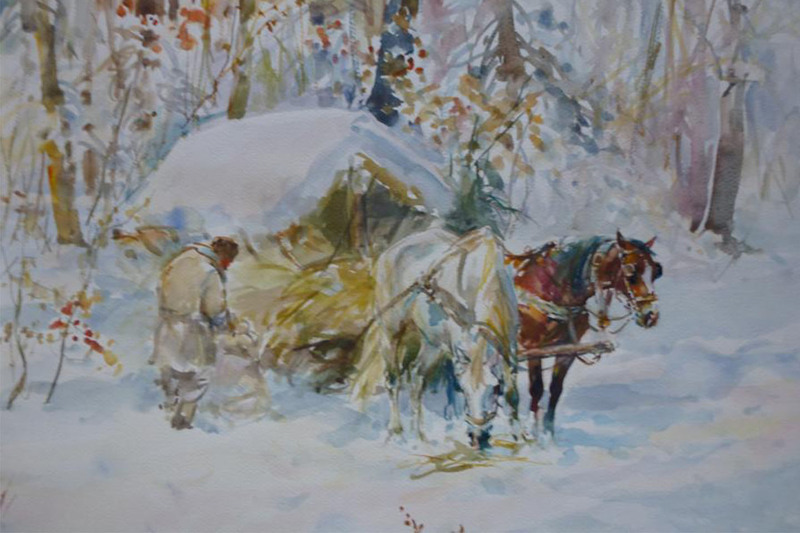 Zenon Aniszewski takes up this tradition and masterly translates it, in a modern interpretation, into his works of art. The Polish Ministry of Arts and Culture recently awarded Zenon Aniszewski a honorary medal for his work. Since 1973, regular exhibitions have given proof of his productive artistic activity. Zenon Aniszewski is an artist who is in demand internationally and regularly makes contributions to exhibitions in Europe and the USA. 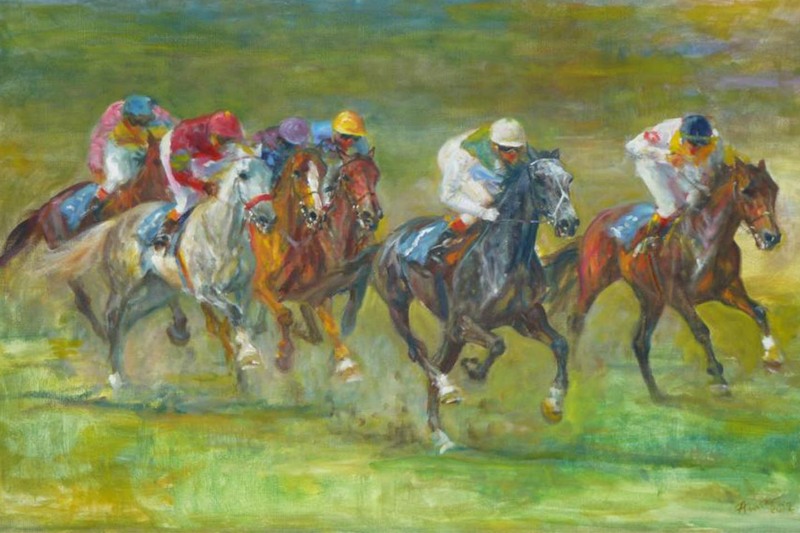 In the US in particular, his paintings enjoy great popularity and recognition. 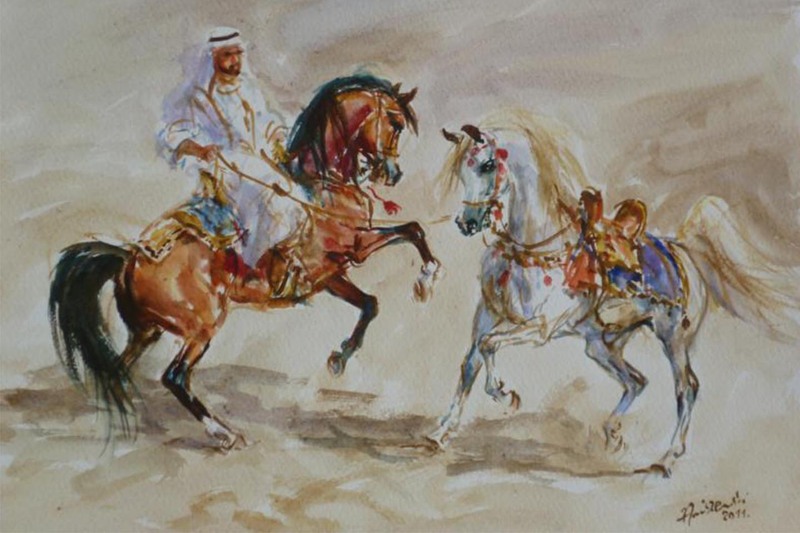 Meanwhile, they are an integral part of many private and even royal collections in Europe, the USA, and the United Arabian Emirates.